These days there is only one right answer when someone asks you what you are doing after work. Hitting the gym! With an explosion of apps, clothing, devices, and countless DVDs, fitness has never felt more modern, and the gym is its holy laboratory, alive with machinery, sweat, and dance music. But we are far from the first to pursue bodily perfection—the gymnasium dates back 2,800 years, to the very beginnings of Western civilization. 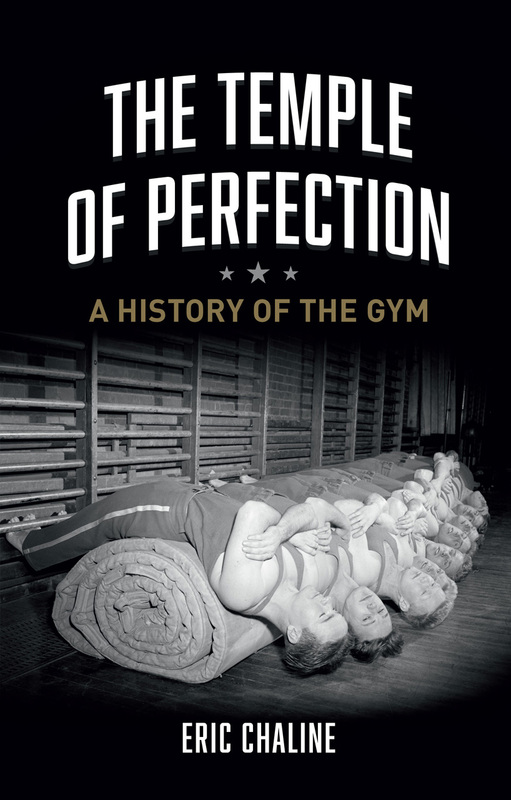 In The Temple of Perfection, Eric Chaline offers the first proper consideration of the gym’s complex, layered history and the influence it has had on the development of Western individualism, society, education, and politics. As Chaline shows, how we take care of our bodies has long been based on a complex mix of spiritual beliefs, moral discipline, and aesthetic ideals that are all entangled with political, social, and sexual power. Today, training in a gym is seen primarily as part of the pursuit of individual fulfillment. As he shows, however, the gym has always had a secondary role in creating men and women who are “fit for purpose”—a notion that has meant a lot of different things throughout history. Chaline surveys the gym’s many incarnations and the ways the individual, the nation-state, the media, and the corporate world have intersected in its steamy confines, sometimes with unintended consequences. He shows that the gym is far more than a factory for superficiality and self-obsession—it is one of the principle battlefields of humanity’s social, sexual, and cultural wars. Exploring the gym’s history from a multitude of perspectives, Chaline concludes by looking toward its future as it struggles to redefine itself in a world in thrall to quick fixes—such as plastic surgery and pharmaceuticals—meant to attain the gym’s ultimate promises: physical fitness and beauty. - Raising the arms from your sides to an overhead position. The side dumbbell lateral is an example of this function. - Raising the arms in front of you to an overhead position. Straight-arm front raises use this function. - Bringing your arms out to the sides and back from a position of straight out in front of you, as in the bentover lateral raise movement. All shoulder exercises, including presses, upright rows and bentover elbows-out rows are variations of these movements. For balanced development the muscles must be worked with each function the deltoid performs. The Compound Shoulder Blast incorporates all the deltoid functions. The look we are striving for here is that of deep, vascular, striated, carved out of rock definition and separation between the heads. To achieve this while providing maximum growth-building intensity, we will use low reps and continuous movement. This means NO REST BETWEEN SETS. Instead, we will nonstop blast, alternating exercises and shifting the tensin from one muscle area to another throughout the program. Your medial delts rest as you train your anterior delts, and your anterior delts rest as you train posterior delts. The trick is to do this while keeping the poundages respectable enough to stimulate the deep muscle fibers. A compound set is similar to a "giant set," where you do a cycle of several different exercises for one set each, then repeat the cycle. Begin this program with two cycles. Then progressively increase to four. I've done as many as six the final weeks before peaking. The Compound Shoulder Blast is done entirely with dumbbells. You will use the same weight throughout a cycle. In the beginning you may have to put the dumbbells down for a few breaths, but your first goal is to go through each cycle without putting down the dumbbells. Progressively decrease your rest periods between cycles, resting only as long as absolutely necessary. Once you get those rests down to 10 seconds, you've mastered the routine! Shortening your rest periods is a method of increasing intensity similar to increasing poundage. Don't increase the weight on these exercises until you've mastered the short rest periods. Once you've accomplished this, strive to use heavier dumbbells whenever possible. Start with a pair of dumbbells at arms' length in front of you, all four ends on your front thighs, palms toward you. Keep your arms slightly bent. Raise the dumbbells up in front of you to eye level. Lower slowly. Do as many of these simultaneous front raises as possible. Use a weight you can do 8-10 reps with. 2) Move the same dumbbells to the sides of your thighs to begin Standing Laterals. Keeping your elbows slightly unlocked, raise them out to your sides. Keep your palms down and your thumbs from coming up. Raise the weights to eye level and lower slowly. Do these until you can't complete any more full reps.
4) Continue the set with Upright Dumbbell Rows, bringing your elbows high and the dumbbell to chest level. Let the dumbbells move away from each other as you bring your elbows to shoulder level. This movement brings your elbows out to the sides more than standard upright barbell rows, working the delts at the attachment near your trapezius strongly. The change makes this unique row more of a delt movement than a trap exercise. 5) When you can't do any more upright dumbbell rows clean the weights to your shoulders and press them overhead. Keep your elbows out to your sides during these Dumbbell Presses. Continue until the weights won't go up. 6) Bend over at the waist until your upper body is parallel to the floor. If you have low back issues brace your head on a high or incline bench. Be mindful not to strain your neck if you choose to do this. Start with the dumbbells touching, palms toward each other. Raise them out to your sides, keeping your elbows slightly unlocked. Do as many Bentover Laterals as possible. Take a 10-second rest, then repeat the cycle. Always take a full 10 seconds rest between cycles to allow the muscles to rid themselves of lactic acid buildup. If you don't need 10 seconds rest the weights aren't heavy enough. I developed the Compound Shoulder Blast while training for a string of guest posing appearances in 1983 and '84. It evolved from another deltoid dumbbell program in which I began with upright dumbbell rows and then worked down in weight until I arrived at a poundage I could do laterals with. From there I moved to L-Laterals, then bentover laterals. The next step was to formulate an exercise incorporating all the deltoid movements. The routine is so intense that I still find myself going back to it. If you find yourself going stale from pressing and pushing heavy weights overhead, this shoulder shocker may be just what the doctor ordered. Give the routine six weeks, then return to a standard shoulder workout.